At the end of May, Nadezhda Kutepova, the CEO of Planet of Hopes, an NGO in Ozyorsk, a ‘closed’ town in the southern Urals, received an anonymous text message reading: ‘I saw the report where they called you a traitor’. The message referred to a story broadcast on Rossiya 1, a popular state news channel. Standing in front of the town’s barbed wire perimeter fence, the channel’s correspondent, Olga Skobeyeva, declared that the NGO’s ostensible support for pregnant women was just a front for its true role: ‘carrying out industrial espionage in return for American cash’. 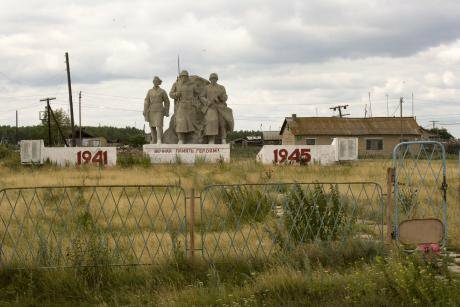 The Soviet Union established closed towns and cities, with stringent residence and travel regulations, during the 1940s—usually because they were the location of sensitive military, industrial, or scientific facilities, such as arms plants or nuclear research sites. Their number was much reduced in the 1990s, but Ozyorsk remains a closed town because of its proximity to the Mayak plant, a source of plutonium during the Cold War and now a facility for processing nuclear waste and recycling materials from decommissioned nuclear weapons. Rossiya 1’s claims of ‘treachery’ evidently alluded to statements made by the NGO’s staff that the closed town system contravened their residents’ human rights. Skobeyeva also claimed, however, that Planet of Hopes’ work in the Urals area, ‘Russia’s largest concentration of mining, and iron and steel industries’, was aimed at promoting the interests of the US National Endowment for Democracy (NED), from which the organisation received much of its funding. On the same day, the regional branch of the Ministry of Justice fined the NGO 300,000 roubles (£3,010) for refusing to register itself as a ‘foreign agent’. Planet of Hopes was set up in 2000 to raise awareness and knowledge of legal issues among the residents of Ozyorsk. ‘It was an uphill task from the start’, says Kutepova. ‘Closed towns have their own ways of working that have developed over the years, and any kind of civil activism is crushed. Over time, Planet of Hopes began to focus on two issues: support for victims of the Kyshtym disaster at the Mayak plant in 1957, the third most serious nuclear accident in history after Chernobyl and Fukushima (kept secret by the Soviet government for 30 years), and campaigning for the rights of people living in closed towns. In 2003, the NGO set up a community access project at the regional ombudsman’s office and ran seminars for people living in other closed towns facing the same problems and dealing with the same obstacles to solving them. A month before the TV attack on Nadezhda Kutepova, the regional branch of the Ministry of Justice added Planet of Hopes to the register of ‘foreign agents’ after Kutepova had spoken in an interview about the laws relating to closed towns and the lack of legal rights for people affected by nuclear radiation. The Ministry regarded this as proof of ‘political activity’ on the part of the NGO (a criterion for registration): calling it ‘an attempt to influence public opinion about an alleged defect in current legislation’. Planet of Hopes has six paid employees, and has always been dependent on funding from outside Russia. According to the regional Ministry of Justice, in 2014 the NGO received a total of about two million roubles (£20,065) from the NED (which is now on the new patriotic stop-list of ‘undesirable organisations’, from which Russian NGOs are banned from receiving funding). and the Russian branch of the Heinrich Böll Foundation. At the beginning of June, another documentary about Ozyorsk and Planet of Hopes, made by local journalist Maksim Rumyantsev, appeared on the internet. It was entitled ‘Russia’s Nuclear Heart’. ‘It says that I closed down a nuclear reactor and that I want to create chaos in the country’, says Kutepova. Planet of Hopes has helped people forced to flee Muslimovo village from unexplained radiation. (c) Alan Gignoux / Demotix. The reactor in question was the South Ural nuclear power station, whose construction was halted in 1991 after a public referendum in which 76% of residents of the city of Chelyabinsk voted against it. Kutepova points out that she only became active several years later and could have had no influence on the decision. ‘In the last few months there have been three separate reports about us on TV, all of them calling us “enemies”’ she says. ‘After that I started getting threats; and my children’s classmates were asking them if their mum was a foreign agent. At the beginning of July, I packed my bags and left Ozyorsk with my kids. I was too scared to stay in this small closed town after they showed my front door on TV’. Kutepova also closed down Planet of Hopes. An appeal against the fine failed; the Ministry of Justice confirmed the local court’s decision that the organisation was a threat to Russia’s security. The German-based Heinrich Böll Foundation, which funded several Planet of Hopes projects to help victims of the Kyshtym disaster, has been working in Russia for 25 years. The foundation’s Russian branch is registered with the Russian Federation Ministry of Justice and regularly submits its accounts to the Ministry and other government bodies, as required by law. It has had links with several dozen Russian NGOs, as well as official structures. Half of the foundation’s current projects are solely funded by it, the other half funded in partnership with other grant-giving bodies. Its grant-giving programme focuses on a number of issues: the environment, gender democracy, human rights and funding for research – it works, for example, with the Centre for Independent Social Research (CISR) in St Petersburg. 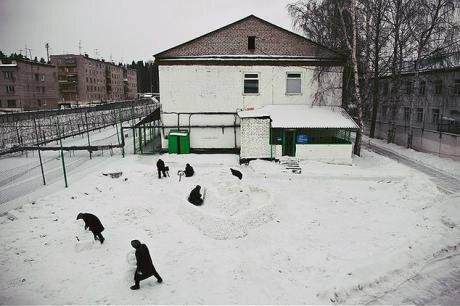 Female convicts at Perm-32, a correctional facility near Perm, Russia. Max Avdeev / Flickr. Some rights reserved. On 22 June this year, CISR was declared a ‘foreign agent’. It does not hide the fact that it has always received a significant part of its funding from outside Russia, and that this now accounts for 80% of running costs. Foreign grants are essential to the Centre, as the issues it investigates include many inimical to the Russian government’s promotion of conservative values. You only have to look at the titles of its reports: ‘Legal wounds: a deconstruction of the values behind gay and lesbian rights in the Russian legal discourse’; ‘Collective action and social politics: the struggle for authority between citizens and the bureaucracy’; ‘Racism in the language of education’. CISR does not refuse government funding – in 2014 it even received a grant of 1,152,000 roubles (£11,700) from the Russian Academy of Sciences’ Institute of Socio-Political Research. This does not, however, have much effect on official negative attitudes to the Centre. ‘There is no money for NGOs to carry out serious sociological research, as opposed to commercial public opinion surveys’, says CISR’s CEO Oksana Karpenko. ‘It all goes to the big universities or the Academy of Sciences’. Now CISR is losing its funders as well. It has been receiving grants from the MacArthur Foundation for about 20 years and in 2009 won a prestigious ‘MacArthur Award for Creative & Effective Institutions’ – a serious distinction for sociological researchers as well as a welcome $350,000 (£224,000) to launch its website and a scientific journal, Laboratorium. But on 22 July, the Macarthur Foundation announced the closure of its Russian branch after it was included in the patriotic stop-list. As ‘foreign agents’, CISR’s managers will now face even greater problems. There will be a lot more paperwork, more frequent inspections and a higher risk of fines. It is also possible that state universities will no longer accept students’ work placements at the organisation as counting towards their degrees. And doing actual research will be more difficult as well. ‘These days, trying to prove that you are not involved in any political activity or oiling the wheels of global imperialism is pretty much a lost cause,’ concludes Oksana Karpenko. Can NGOs survive on Russian funding? There are now 78 NGOs on the ‘foreign agents’ list. At least 43 of them are involved in education, awareness raising or research. Twenty organisations of this type were added to the list in 2014, and 23 more have been added in 2015. Five NGOs have also been taken off the list – four of them closed down; the fifth changed its profile. Until the recent creation of the patriotic stop-list, Russian NGOs had five major foreign sources of funding: The Norwegian Helsinki Committee, The MacArthur Foundation, the NED, the European Commission and the Open Society Foundations (OSF), also known as the Soros Foundations. These five, funded 27 out of the 43 educational, awareness raising and research organisations on the foreign agents register. Among other sources of funding were foreign embassies, including those of the Netherlands, the UK and Germany. Here is what has happened to three of them since their funders have had to withdraw. The Committee for the Prevention of Torture, added to the ‘foreign agents’ register in January 2015, was funded by OSF and MacArthur Foundation, and the Swiss-based Oak Foundation. Since 2013, it has applied for Russian government grants four times, and has been successful three times out of the four, receiving awards of over five million roubles (£51,000) in total. Of the three successful projects, two were focused on the prevention of torture and the third on ensuring public access to justice through free legal centres and public lectures. The Committee needs 60-80m roubles (£602,000-803,000) a year to continue its work, not allowing for any expansion in the regions – 60m to cover core costs and the rest for extra projects and medical care for victims of torture. In 2014, foreign funding covered 90% of the costs, Russian sources 10%. On 24 July, the members of the organisation voted to close it down, refusing to continue working with the status of ‘foreign agents’. Golos, literally ‘voice’ or ‘vote’, was declared a ‘foreign agent’ in July 2014. It was previously funded by USAID (until 2012) and the European Commission. Established in 2000 to protect the electoral rights of citizens and to foster civil society, Golos is Russia’s only independent election watchdog. It previously received $700,000 (£448,000) for each election cycle, but since the passing of the ‘foreign agents’ law it has had to give up its foreign funding (70% of its budget) because as a ‘foreign agent’ it would be unable to observe elections. According to its CEO Grigori Melkonyants, the most the organisation can hope to receive from the Russian government is 5m roubles (£51,000) – nowhere near enough to survive. On 23 July, the Ministry of Justice returned 400,000 roubles (£4,069) to Golos, the fine it had had to pay for refusing to register as a ‘foreign agent’ – in September 2014, the Moscow city court ruled that the decision to add the organisation to the register was unfounded. The NGO’s name, however, has still not been removed from the list. This NGO was included in the register in August 2014: its funders were the European Commission’s Directorate-General for Budget, NED and the UN Office at Geneva. It voluntarily gave up its foreign funding in July 2014 after receiving a Russian presidential grant of around 7m roubles (£71,200) but was nonetheless registered as a ‘foreign agent’. This year the organisation applied for another presidential grant, but was turned down. Its current grant runs out in August, and the next application can only be made in October. The Soldiers’ Mothers used to receive about 4-5m roubles (£50,900- £61,000) annually from foreign donors, but do not plan to apply for any more. This article originally appeared in Russian on Colta.ru as part of the School of Civic Journalism initiative. oDR is grateful for Colta's permission to translate and re-publish this article here.